Retailers of the Great Pacific Northwest! 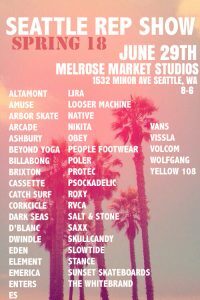 We highly recommend checking out these shows if you are a retailer in the Seattle/Portland area. These smaller regional shows are a great opportunity to maximize your time and get some serious work done for the Spring18 season. You can see tons of brands/reps and work at your own pace. We’ll be reaching out to book appointments for both shows, but please feel free to holler if you want to lock down a date and time.